“What unbelievable vision Oyster Jim Martin has had with the inception of this trail, and how well thought out it is. Various accesses, excellent signage, degrees of difficulty well indicated - and views, oh my gosh, the views. A million photos could not do justice to the force and might and grandeur of the Pacific Ocean and this shoreline, it's something that must be experienced". Our AGM celebrates our past year and looks forward to our goals ahead. We also hold an election of members to the Board of Directors. Nominations for Board members made by members in good standing should be forwarded to WPTS by April. Members in good standing may vote in person at the Annual General Meeting. The general public is most welcome to attend our AGM or our board meetings, usually held on the first Wednesday of the month, September through June. Dates posted on this page. Board members and our close partners have been attending yearly development sessions and continue to dream big! Future plans are in the works for expanded interpretive walks on the trail with our program partners, our Trail Ambasador and special guest interpretors. We are also planning more interpretive displays, new trails and concepts for a Wild Pacific Trail education centre. Stay tuned, this group moves fast! PDF of 2017 events, projects & milestones. PDF of 2016 events, projects & milestones. PDF of 2015 events, projects & milestones. 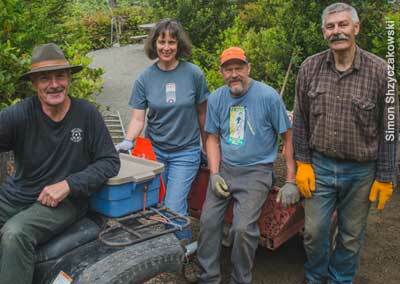 Please contact info@wildpacifictrail.com if you wish to volunteer time to the trail. Mail: Wild Pacific Trail Society, PO Box 572 Ucluelet, BC, V0R 3A0. Behind every great visionary is a committee making the dream come true! Formed in 1999, the Wild Pacific Trail Society is a registered non-profit organization. 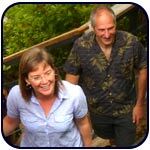 The Wild Pacific Trail Society board is comprised of a committed and passionate group of a dozen Ucluelet citizens with a wide and diverse range of skills, knowledge and experience. Each director is deeply committed to the vision and mission of the society. Board members work on individual areas of interest: trail planning, educational programs, promotion, administration, signage, and communication with the assistance of a part-time administrator and a trail naturalist. Fundraising is a key funcion of the society through donations, bench sponsorships and grants. 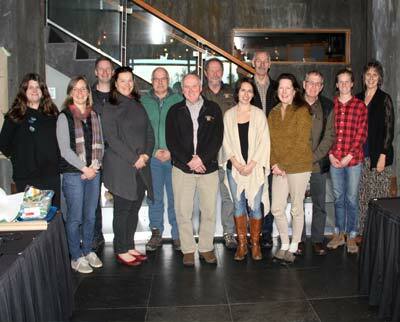 The board is supported by a strong network from the district of Ucluelet to regional organizations and local business. While the Wild Pacific Trail Society’s main focus has been trail development, trail-based educational programs have emerging as a high priority to connect people to nature. Free guided programs and site-specific interpretive signage grows every year. The WPTS holds public board of director meetings generally on the first Wednesday of every month September to June. Board meetings take place at 7:00 p.m. at the Ucluelet Community Centre located at 500 Matterson Drive, Ucluelet, BC. The public is welcome to attend. The length of each meeting is based on the evening agenda. To learn more click to this PDF listing society achievements in 2017, as presented at our 2018 AGM. Thanks to our tireless administrator for this report! Save this date for a celebration of our 20th anniversary. If you are a donor, former director or volunteer please email us so we can send you a personal invitation, we would like this event to be a homecoming for the huge number of people who have supported us through the years. Check back for further details. To inspire a personal connection with nature to create a wave of change for environmental stewardship. Hundreds of Ucluelet citizens, businesses, landowners and the district of Ucluelet have contributed their time, money and ideas to making this trail possible. The WPTS board is invested with making this vision a reality. Special thanks to Abby Fortune (District of Ucluelet staff liaison) and Marilyn McEwen(District of Ucluelet Council representative) for their strong participation at our monthly meetings and planning sessions. Ucluelet First Nation has also been an important contributor to the existence and enrichment of this trail. Partners in educational programs: Silva Johannson, Ucluelet Aquarium, Raincoast Education Society, Central Westcost Forest Society and more. The trail itself has also earned thousands of supporters and fans who contribute to donation boxes at trailheads. Visit our DONATE page to learn more about the dreams and goals of the society. For more trail history go to Oyster Jim’s Story: Birth of a Famous Trail. 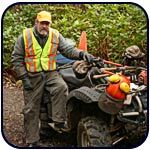 The WPTS would like to thank Oyster Jim Martin and Danielle Francis for their hard work keeping the trail in top condition.The WPTS has administered the maintenance contract for the trail since 2013. There have been vast and noticeable improvements to the trail bed, views and vegetation management with regular maintenance. Volunteers have helped to build viewpoints at Inspiration Point in 2017, stairs at He-Tin-Kis Beach in 2014 and countless other smaller projects or work-bees. Trail users are encouraged to pick up litter and stay on the gravel to prevent damage to the fragile forest fringe. In 2016 a large marine mammal identification sign was installed at Amphitrite Lighthouse as part of an observation network from Baja California to Alaska called the Whale Trail. Thanks to the Vancouver Aquarium, Strawberry Isle Marine Research Society and the Whale Trail for this excellent partnership. 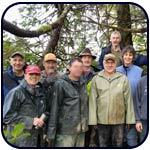 CONTACT US: Wild Pacific Trail Society, Box 572, Ucluelet, BC V0R 3A0 or email us. COPYRIGHT: All images and website content is copyrighted by the Wild Pacific Trail Society. The Wild Pacific Trail logo is also copyrighted. Contact the society if you wish to obtain any promotional content. Links to this site are welcome and do not require permission. Visit Ucluelet.ca for information on our community and ammenities.